The Fayoum does not really constitute an organized pyramid field, though there are several located at Lisht. 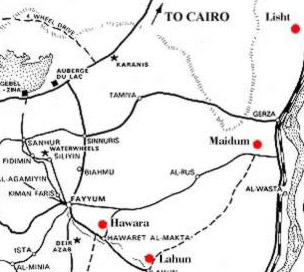 However, the other pyramids of this region or spread about with those of Lisht and Maidum being very close to the Nile River, while Lahun is father away, and Hawara still further west. While each of the pyramids located in the Fayoum might be considered a small necropolis, these pyramids are likewise not located in any large, organized necropolis like many of the fields to the north. In general, the pharaohs who located their pyramids here had a specific interest in the Fayoum, and some of them probably built their palaces in the region. Hence, they were not simply locating their pyramids in a Memphis related necropolis.